EB expo 2012 introduced the first annual EBX Awards and for those that voted and were curious as to who won what, the results are now available! All the major publishers bring out their big guns for the year at the annual event and as such, the competition was fairly tight given the quality and quantity of stand-out titles as we approach the end of 2012 and start of 2013. With 30,000 gamers in attendance this year, there were quite a lot of votes cast during the voting period. Not surprisingly Assassin’s Creed 3 won the favour of the crowd. The queues to experience Connor was certainly long to say the least. In some cases on Saturday, visitors were in for a two hour wait just to sample the game. Ubisoft also scored the title of Best EB Live Presentations for its impressive showing. Ed Boon’s appearance and presentation to the media for Injustice: Gods Among Us may have helped Warner Bros. Interactive Entertainment claim the coveted Game of Show (Media Selection) title. Having had a chance to listen to Ed Boon speak and play the game, it was most definitely much more engaging than my initial impressions. 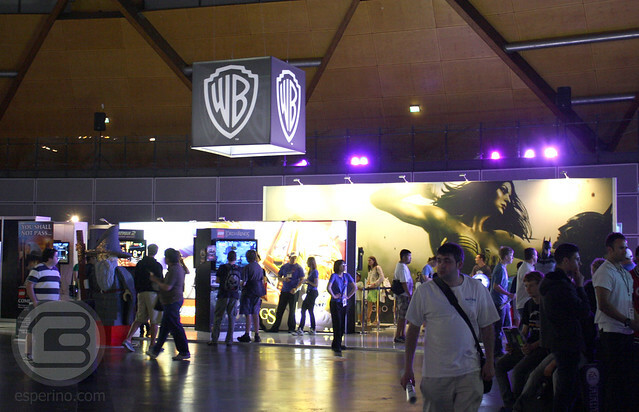 Warner Bros. Games took out the Best Game Publisher Booth award with its gorgeously decoratived booth. There was a little something for everyone from the life-size Batman that provided photo opportunities, to the mammoth LEGO constructed Gandalf from LEGO The Lord of the Rings. Microsoft cinched the most anticipated award with Halo 4. The 343 Industrie’s developed Halo outing has all the hallmarks of what fans expect from the franchise, looking very much in command as a blockbuster hit when Master Chief once again returns to the Xbox 360. Lastly was Parrot and their popular AR Drone 2.0 which took out the Best Non-Game Booth award. Fans were able to get hands-on with their trademark AR Drone, taking the flying device for a spin in their contained booth space. Are the results as you expected? EB Expo 2012: Girls of EB Expo!